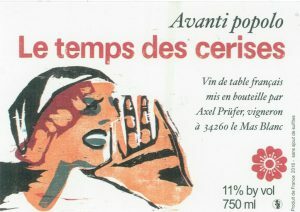 Axel Prüfer was born and raised in East Germany but moved to France as a young man to take up a career in wine making. He produces delicious wines naturally with as little intervention as possible – many of his wines have no added sulphur. In fact, on a visit to his winery we tried one of his cuvees which had been bottled without sulphur and one that had been bottled with minimal amounts of sulphur and the result was simply amazing. The one without sulphur stood head and shoulders above the other for freshness, vitality and flavour. He has been described as a ‘darling of the natural wine bar movement’. He is a quiet, thoughtful and engaging young winemaker who is totally committed to producing non-interventionist wines. We visited him in the mountains behind Beziers and were fascinated by the lengths he goes to in ensuring that his grapes are healthy and his wines are pure. Every sentence he utters is the result of deep thought. 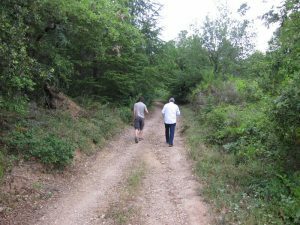 We discussed the problems of grapes grown in monocultures such as in Chablis and Champagne and then crammed into his small truck to bump our way up hillsides through thick forest and then for the final part of the way by foot until we reached his remote vineyard surrounded by forest. There is absolutely no chance of spray-drift here! Because the forests are the natural habitat of wild boars, Axel collects human hair from the hairdressers in the local village and spreads it around the boundary of his vineyard. He says that the boar pick up the human scent from the hair and avoid the vineyard. 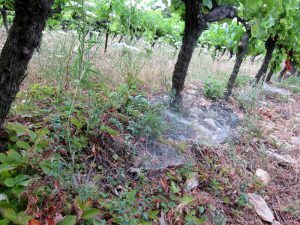 The vineyard is a picture of health with spiderwebs everywhere and an amazing biodiversity on display. All this is for nothing of course if the wine doesn’t taste delicious. 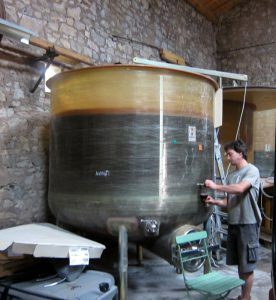 Axel only uses natural yeast to ferment his wines and he adds no sulphur at all (we put a ‘Contains Sulphites’ warning on the label because some sulphites can be naturally produced during the wine making process). This gives them a liveliness that is most appealing. He uses tanks made from stainless steel or fibreglass or large, old barrels that impart no oak flavour. The tanks have ‘floating’ lids so that no air can get at the wine if he does not have enough to fill a tank. 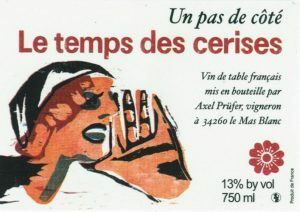 Axel only produces small quantities of wine due to the low yields from his vines so there is not much available in this shipment. Fou du Roi (the Jester) is a blend of 33% of Grenache Noir, along with 33% Cinsault and 33% Carignan and weighs in at only 12% alcohol. The grapes underwent carbonic maceration to preserve the freshness of the resultant wine. It displays cherry on the nose and has an elegance and vibrancy that is very appealing. It tastes alive! It has good tannin structure which will help as it ages and the finish is long, clean and lively. Definitely one for those who want to explore the complexity of natural wines. Avanti Popolo is a lighter style of wine despite an underlying strength. Named after a revolutionary Italian cry of ‘Forward People’ this wine made from mainly 90 year old vines. The wine is predominantly Carignan with a splash of Grenache this year. The wine has not been filtered or fined, and has no additions. The vines grow on granitic quartz soils and the minerality is pronounced. The 2014 vintage is an absolute winner! It is lighter than the iconic Fou du Roi but it has an incredible depth of flavour from the low yielding, very old vines. Les Lendemains qui Chantent is a beautiful and quite restrained wine (in the sense that it is elegant rather than exuberant) made from 100% Grenache from vines that are at least 35 years old. The vineyard itself is situated at 450 metres above sea level in the forests of the rugged Parc Naturel Regional du Haut-Languedoc which lies inland from the city of Beziers. It exhibits very soft tannins and lovely herbal and flower aromas. There is a distinct minerality associated with this wine derived from the decaying granite and quartz soils. 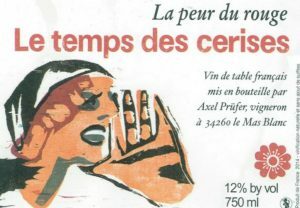 It is Axel’s leading cuvée, but he only releases it in years where the crop is exceptional! And this year it is certainly exceptional. This is a stunning wine of great elegance and charm which may benefit by being poured into a carafe just before drinking. This is an excellent food wine. Un Pas de Côté is a dark purple wine that has a beautiful, soft tannin structure with complexity coming from the quality of grapes used. While it used to be a pure Grenache in previous vintages, in 2014 it is 40% Merlot, 40% Grenache and 20% of a blend of Cinsault, Aramon and Carignan (Aramon is a grape that is native to the region). The vines grow on granitic quartz soils and the minerality is pronounced. The grapes undergo carbonic maceration for a period of two weeks. Axel Prüfer can definitely be described as a low interventionist winemaker. This incredibly complex wine is 100% Chardonnay from Axel’s vineyard that is dotted with large limestone rocks. The wine is packed with minerality derived from the limestone. Only a wine made from perfect fruit grown without sprays, irrigation and artificial fertilisers could possibly taste like this. So drink this if you have a “fear of the red” since la peur means fear. 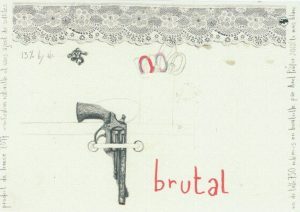 The “Brutal” brand is an effective marketing campaign that sees the same label used by dozens of winemakers ranging from Spain through to Austria. Axel is one of those winemakers. Each year he produces either one or two cuvées and releases it under this brand. This year his red (a light red with a good tannin background) Brutal is made from 80% Carignan and 20% Syrah to give a wine that is nothing like it was last year. However, it is still quite light despite the darker colour and it is still distinctively an “Axel” wine. He picked the grapes later than last year and the maceration extended over 6 weeks to extract a bit more colour. This is a bit complicated! 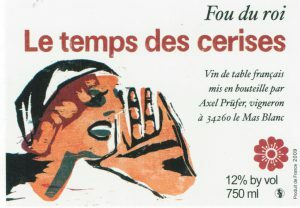 In the last couple of years the wine from Axel which sells most quickly is Brutal (sometimes called Fatal Brutal), his super-fresh and light Cinsault, that’s always between 10 and 11% alcohol. Axel’s decided to mix things up a bit this year. The whole idea of the Brutal project (many winemakers make a Brutal) is that it was to be something unexpected and he thinks now his Brutal no longer unexpected. The old Brutal now has a permanent name. 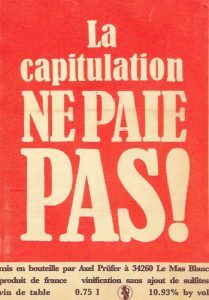 It’s called “La Capitulation Ne Paie Pas”, based on a journal cover / poster from the resistance during the 1968 protest movement. (The translation is Capitulation does not Pay – very Axel!) So, if want to order what you think of as Brutal this is what you need to order. This year it is 10.93% and, as always, is best served chilled like a rosé.